Thrombin activates PARI by binding to and cleaving its amino terminal exodomain (Fig. 1). This cleavage event is both necessary and sufficient for receptor activation. Mutation of the cleavage site ablates receptor signaling, and substitution of cleavage recognition sites for another protease for the thrombin site confers signaling in response to that protease. Thus, the essential role of the protease in activating PARs is cleavage of the receptor at a single site within its amino-terminal exodomain. How does cleavage of this apparently flexible, unstructured domain send information across the cell membrane? The synthetic peptide SFLLRN, which mimics the first six amino acids of the new amino terminus unmasked by receptor cleavage, functions as an agonist for PAR1 and activates the receptor independent of thrombin and proteolysis. Moreover, removal of the amino terminal exodomain of the receptor yields a receptor that responds to SFLLRN but not to thrombin. These and other data support a model in which receptor cleavage serves to unmask a new amino terminus that then functions as a tethered peptide ligand and binds to the heptahelical segment of the receptor to effect transmembrane signaling and G-protein activation. Thus, PAR1 is in essence a peptide receptor that carries its own ligand, and this ligand remains hidden until revealed by selective cleavage of the amino terminal exodomain of PARI. This mechanism raises several interesting questions, addressed below. How is it that the PAR1 tethered ligand remains inactive in the uncleaved receptor and is activated by cleavage? Addition of even one amino acid to the N terminus of the SFLLRN agonist peptide ablates agonist activity, as does removal of its N-terminal protonated amino group. In the uncleaved receptor, the cognate nitrogen atom is part of the peptide bond between Arg41 and Ser42, the P1 and P1' amino acids of the thrombin cleavage site. Ser42 is also the N-terminal amino acid of the tethered ligand. Thus, the pro-teolytic switch that activates the cryptic peptide ligand appears to involve removal of amino terminal sequence that sterically hinders ligand function as well as generation of a new and functionally important protonated amino group at the N terminus of the ligand (Fig. 2). 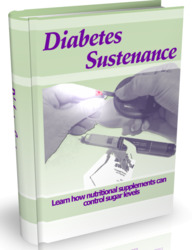 Parallels with zymo-gen activation of serine proteases are apparent. In conversion of trypsinogen to trypsin, precise proteolytic cleavage generates a new amino terminus that bears a new protonated amino group; this then docks intramolecularly to trap the protease in its active conformation. Figure 1 Model for proteolytic mechanism of PAR activation. (1) Thrombin, the green sphere, binds to the amino-terminal exodomain of PARI. Receptor amino acids L38DPR41 (small blue sphere) interact with the active center of thrombin, and receptor amino acids D50KYEPF55, the so-called hirudin-like domain (pink oval), interact with exosite 1 of thrombin. (2) After binding, thrombin cleaves the receptor between R41 and S42 to create a new amino terminus beginning with the sequence S42FLLRN (yellow diamond). (3) Once unmasked, SFLLRN serves as a tethered peptide ligand that binds to the heptahelical domain to effect transmembrane signaling and G-protein activation (4). Does the tethered ligand bind intramolecularly? Where does it bind and how does such binding yield G-protein activation? These questions are both basic and practical. One strategy for blocking PARI function is to block binding of the tethered ligand, and the SFLLRN tethered-ligand peptide has served as a pharmacophore for antagonist development. Intramolecular binding of the ligand to the receptor to which it is tethered would clearly be favored unless prevented by specific structural constraints. Assuming an « 50-amino-acid tether localized the ligand to a hemisphere of radius «100 Á, the effective concentration of the tethered ligand would be on the order of 1 mM; micromolar concentrations of SFLLRN peptide in solution suffice to activate PARI. Structure-function studies indeed suggest that intramolecular ligation is the predominant mode for PAR activation, and the relative ineffectiveness of PAR1 antagonists at blocking cellular responses to thrombin versus SFLLRN is consistent with favored, intramolecular binding of the tethered ligand. Intermolecular ligation of PARs can be demonstrated in certain settings. It is worth noting that intermolecular ligation of receptors in stable dimeric or oligomeric complexes would not be readily distinguished from intramolecular ligation of monomers, but there is as yet no compelling evidence that PARs form such complexes. 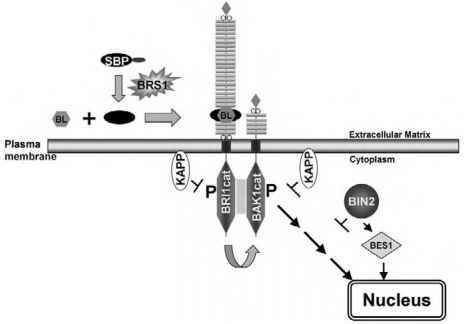 Studies with chimeric receptors, receptor mutations that complement loss of function substitutions in agonist peptide, and blocking antibodies all point to the exofacial domain of PAR1 as being critical for recognition of agonist peptides. Such studies also suggested that PAR exofacial domains interact to form a structure necessary for receptor function. The crystal structure of rhodopsin reveals that the N-terminal exodomain and extracellular loops of rhodopsin interact to form a cap over the heptahelical core of the receptor. Thus, the exofacial domain of PAR1 might be the binding site for the tethered ligand or, alternatively, might function as a kind of template or keyhole that determines access of the tethered ligand to a site deeper in the heptahelical core. A satisfying answer will await a crystal structure. Figure 2 Details of the PARI proteolytic switch. 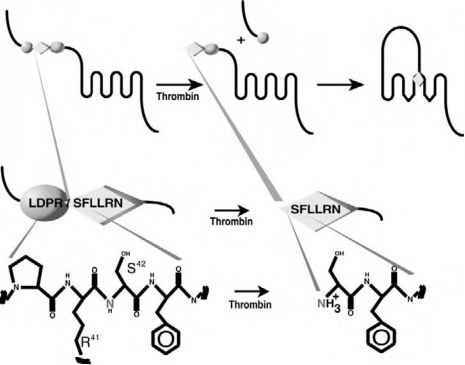 A synthetic peptide of sequence SFLLRN (the tethered ligand sequence) can activate PARI independent of thrombin and receptor cleavage. Adding a single amino acid to the N terminal of SFLLRN or removing its N-terminal protonated amino group inhibits agonist activity. This suggests that cleavage of PARI between R41 and S42 accomplishes two things to switch on the cryptic ligand; it removes an activation peptide that sterically inhibits SFLLRN and creates a new protonated amino group (red N) that is important for agonist function. short lived), the magnitude of the response is related to the rate of receptor cleavage and activation and hence to thrombin concentration. 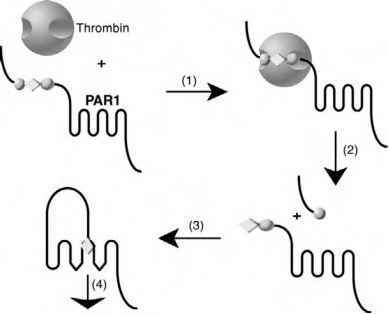 The existence of different PARs that are cleaved more or less efficiently by thrombin may also contribute to differential responses over a range of thrombin concentrations.